Here at Love, we know wedding planning can be a lot to handle, and dress-shopping can seem intimidating at first! You’ll be in safe hands with the Love team of experts, and we’re here to answer any questions you might have as you plan your dream wedding. Here are some common questions about the Love experience that might be helpful as you get ready for your appointment. We can't wait to meet you! We recommend having your wedding date and venue booked before you begin your search for a dress. 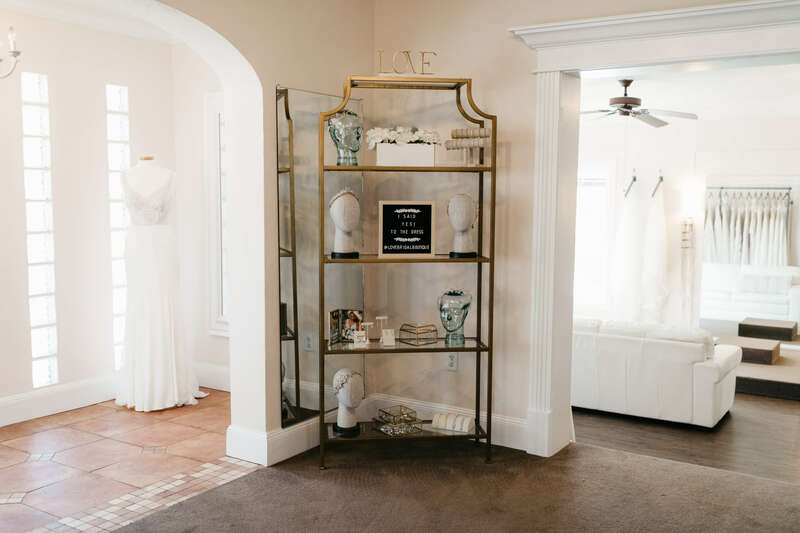 It is important to have the date and location established so you can envision the wedding’s overall look, and know when your dress needs to be ready! Gowns typically take four to six months to arrive in our store, and alterations generally require one to two months. Start shopping about eight to ten months in advance to ensure you have plenty of time to make up your mind without any stress! If your wedding is more than a year away, we recommend waiting a bit. After all, styles and tastes can change, and dresses can be discontinued. 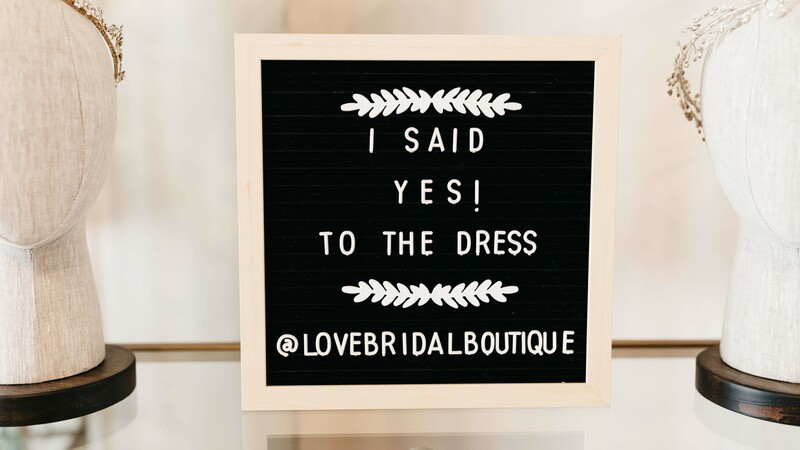 At Love, we want to make sure you start your search when you’re truly ready to say yes to the dress! How much money should I expect to spend on a dress at Love? Our gowns start at $1,400 and go up to $7,000. The majority of our dresses fall in the $1,500 to $3,000 range. We require a 60% down payment at the time of your order, and the remainder is due when your gown arrives. All of Love’s gowns (and accessories!) are crafted by dedicated designers, and often incorporate hand-sewn beading and details. We take great pride in our designers’ work and are confident that you’ll see the difference in quality as soon as you try on your first dress! What should I know about gown sizing? Will you have my size available? The first thing to know is that bridal sizing is NOT the same as normal clothing sizes! We know, we know: as if the process wasn’t complicated enough, right? Bridal gowns run significantly smaller than your regular size, so don’t be surprised if you find yourself seeing a number you’re not used to on your dress. Our sample sizes are mostly size 12’s, which equates to a regular size 8. (See what we mean?) We usually have a limited selection of dresses available in size 20, as well. If you have any concerns or questions about this - give us a call! Don’t worry! We’ll help you envision how the dress will look on you, even if it’s not an exact fit. 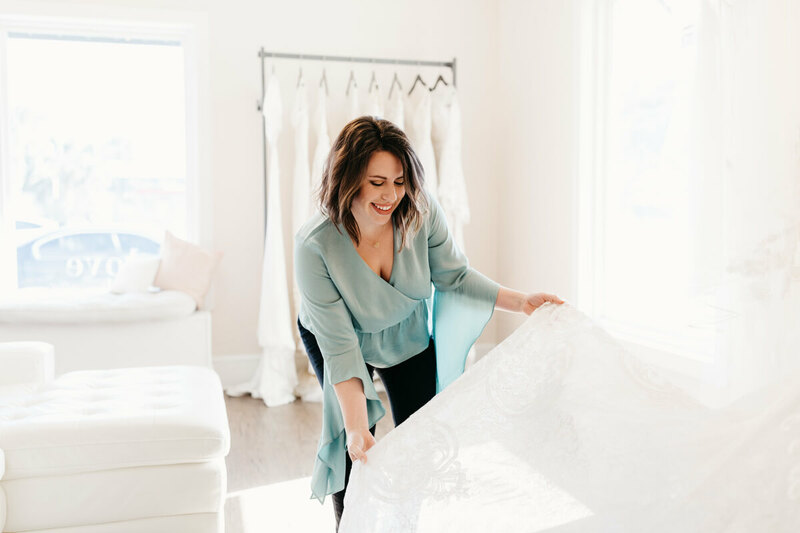 Bridal sizing can be confusing, so your consultant will help you even if you don’t happen to be a perfect sample size (and who is?!). Some silhouettes, like ball gowns and A-line dresses, are easier to try on even if the size isn’t perfect. Talk to your consultant and we’ll do everything we can to help you feel comfortable and confident during your appointment! During your one-hour appointment, you will work with your super-awesome-cool personal bridal consultant the entire time! Our consultants are dedicated to finding the dress that will make you look and feel your absolute best. If you have already have some ideas about your dream dress, feel free to bring along pictures, Pinterest ideas, napkin doodles…we can work with anything! And if you’re coming in blind and have no idea what you want yet, we can work with that, too. Our experienced consultants will make the search as fun and easy as possible; we LOVE (no pun intended!) finding you exactly what you’re looking for, even if you don’t know what that is yet. Be ready to leave with your dream gown! What if I need more than an hour to choose my dress? If you need more time to make your decision, we will schedule a return appointment for you. Our goal is that every bride we meet says yes to the perfect dress while having the best time! While we are a family-friendly store, we host multiple appointments at a time, and although you’ll have your individual appointment space, children can be a distraction. In our experience, children also get bored quickly, seeing wedding dress after wedding dress. As such, we strongly encourage you to leave the kids at home and let yourself focus on your dress hunt. If you need to bring children to your appointment, we ask that they remain seated and quiet, and have some type of entertainment (other than seeing how gorgeous you look!). Can I bring champagne to my appointment? Who doesn’t love champagne?! We certainly do! However, as we are a smaller boutique and Saturday’s can be very busy – we do not allow any champagne in the store on Saturdays. We also have found that champagne can slow down an appointment, and we want you to make the most of your appointment time while here, focusing on finding your gown! If you really, really, really want to have some bubbles during your appointment, please give us a ring. We can schedule you an appointment during the week and make special arrangements. Generally, our gowns take four to six months to arrive, and you should plan for one to two months for alterations. Because we’re a small boutique, we do not offer in-house alterations, but we’ll recommend some experts whom we love and have worked with for years. While you’re waiting for your dress to arrive, we recommend you select your shoes, because you’ll need them when you start your alterations! Yes! Alterations make a dress truly YOURS, tailoring your gown perfectly to your body and your style. A seamstress can work wonders – shortening straps, hemming the length, adding a bustle – almost anything you can imagine to make your dream dress a reality. Don’t be worried that your dress needs altering! It’s a totally normal part of the process, and you’ll be so thrilled when you put on a gown perfectly customized for you. Are alterations included in the price of my gown? No, we do not perform alterations at our boutique, although we’ll happily refer you to a trusted seamstress to perfect your gown. We recommend budgeting $300 to $600 for most alterations, although more complex alterations – like adding sleeves or extra beading – may incur additional costs. What happens during my pick-up appointment? At your pick-up appointment, you’ll be trying on your actual wedding dress, and – most exciting of all – taking it home with you that very day! 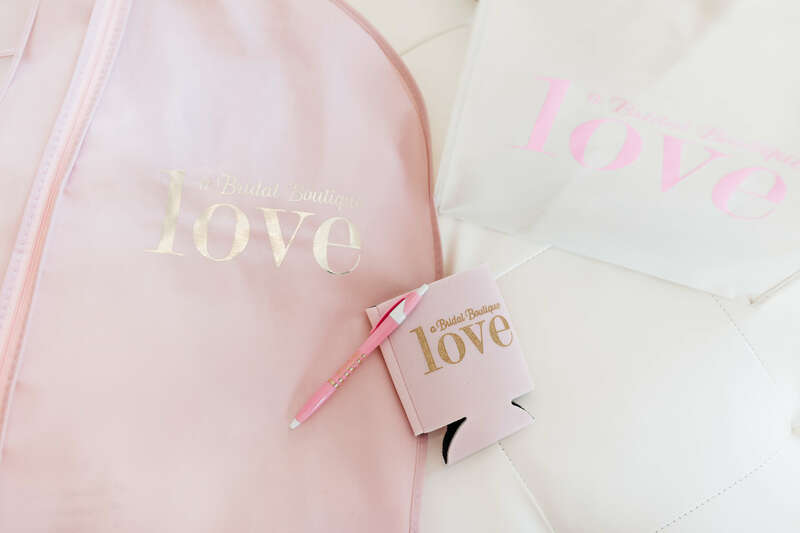 Your dress will be packaged in a beautiful pink Love garment bag, so it will be protected and, if you’re storing your gown at home, your fiancée won’t be able to see! How can I choose my accessories? At Love, we have plenty of gorgeous veils and jewelry headpieces to complete your look. Your consultant will recommend accessories during your appointment to help accentuate your gown. If you don’t choose any accessories on your first visit, we recommend you try on some with your dress at your pick-up appointment, so you can see the whole look together! Accessories take ten to sixteen weeks to arrive in store. Please take a look at our bridal accessories here! How can I clean and preserve my dress after my wedding? After the champagne, the toasts, and the dances, have your dress cleaned and preserved as soon as you can! The longer stains set in, the harder they are to get out, so have a plan to drop your dress off at a trusted cleaner. If you’re a Jacksonville bride, Love works closely with Oceanside Cleaners. They will carefully examine and hand-wash your dress, protecting any beading, lace, and embroidery, then give it back to you looking as beautiful as the day you brought it home – regardless of what happened at the reception. Ask about their discount for our Love brides, too!